Pages of gear covering everything from weapons to incantations. 330 spells divided between 30 traditions of magic. 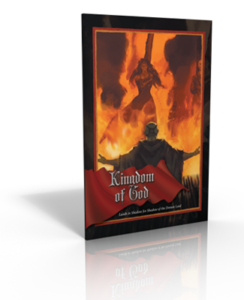 You can buy the PDF from Schwalb Entertainment or DriveThruRPG! Thousands of years ago on the continent of Rûl, the son of the Faerie Queen Titania defied his mother’s will by involving himself and his faerie followers in mortal affairs, allying with the First People to wage war against the invading Edene. Forever condemned by Titania as a traitor to faeriekind, the Betrayer, as he came to be known, turned to the Devil to bargain for his aid in defeating the Edene. But this deal proved to be a terrible mistake, as Diabolus dithered and balked at issuing forth his hogmen legions from Hell, giving the Edene God-Queen Umessa time to slay the Betrayer in battle and scatter the elf-lord’s followers throughout the continent. In defeat, the Betrayer’s followers suffered the enormity of their leader’s bargain, finding themselves forever stained, sullied, and corrupted. Transformed into hideous thralls of Hell, these darklings have hidden in Rûl’s shadows, forced by the Betrayer’s pact with the Devil to corrupt and lead mortals into damnation. But as the Demon Lord’s shadow spreads over the Urth, these wicked faeries find themselves drawn out of their exile in darkness, either to take up arms against the common threat or to join forces with the Hunger in the Void to bring an end to their suffering. Scions of the Betrayer kicks off a new series of supplements for Shadow of the Demon Lord that reveal the forgotten peoples, places, and relics littering the lands of Rûl. Scions examines the darklings, warped faeries forever bound to serve the Devil, and makes them available to players as a new ancestry and to Gamemasters as a dreadful new foe. 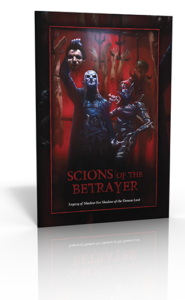 Buy the PDF or print version of Scions of the Betrayer from Schwalb Entertainment or DriveThruRPG! Though the First People have vanished from the face of Rûl, their monuments remain. From the Northern Reach to the tangled woodlands of Balgrendia, one can find weathered monoliths scrawled with runes, standing stones arranged in circles, and other ancient markers that hint at the societies that once thrived in these lands. But the darkest and most sinister of these edifices are undoubtedly the barrows, for under these grassy hills sleep the dead. Although these tombs promise riches and relics, they also threaten death, for the dead lie in restless slumber and any intrusion can call their souls back from the Underworld to vex the living in bodies rotted and wrecked. And once roused, these barrow wights remain, eager to punish the living for the crimes of their ancestors. 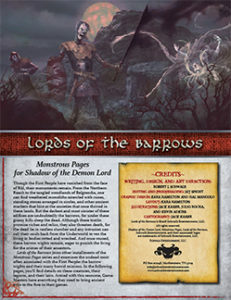 Lords of the Barrows joins other installments of the Monstrous Pages series and examines the undead most often associated with the First People: the barrow wights and their many horrid minions. 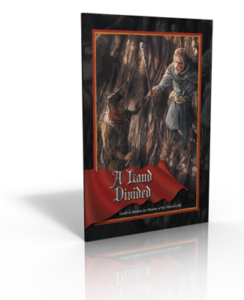 In the following pages, you’ll find details on these creatures, their legions, and their lairs. 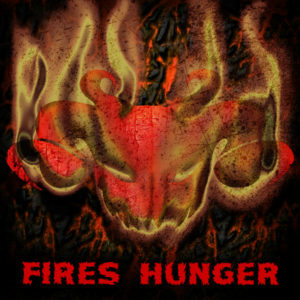 Armed with this resource, Game Masters have everything they need to bring ancient evils to the fore in their games. 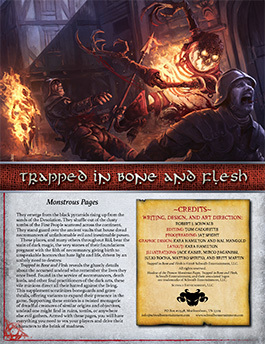 We’re proud to announce that Bred for Battle for Shadow of the Demon Lord is now available in print exclusively from DriveThruRPG! Grizzled veterans of countless campaigns, brutish barbarians spilling out from the hinterlands, peerless champions fighting for a noble cause, or hard-bitten mercenaries who have seen it all: these character concepts describe just a few of the possible types of warriors one might find in the Shadow of the Demon Lord. Although warriors might have many different expressions and stories, they all are exceptionally capable with arms and armor in battle. As their experience grows, so too does their durability and dependability. At the outset, warriors distinguish themselves by the weapons they wield and the armor they wear, but not until they move onto other paths do they truly come into their own. Until now. Bred for Battle builds on the warrior novice path presented in the main rulebook by providing new customization options for combat-focused characters. These options offer more variety in technique, reflecting the nature of a warrior’s training and providing inspiration for future development. 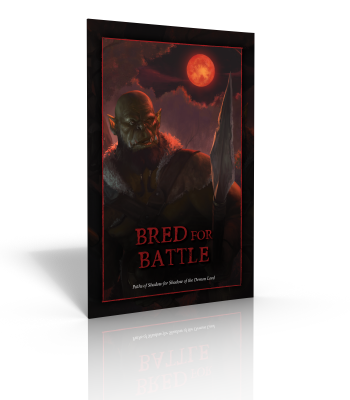 Buy Bred for Battle as a PDF from Schwalb Entertainment or DriveThruRPG! In the years leading up to the orc uprising, the Empire saw incredible innovation, as constructs and other mechanical beings emerged. Although their creation was prohibitively expensive for large-scale manufacturing, wealthy individuals could commission such wondrous devices to toil in mines, haul cargo off and onto ships, and perform whatever other labors they commanded. In Lij, clockworks joined the ranks of other mechanical beings, but rather than be powered by magic or engineering, they derived mobility from souls anchored to their unliving components. Although some believe these marvels to be recent developments, the methods of their creation can be traced back to antiquity, to the time of the Edene and older, lesser-known peoples before them. The dreaded prometheans and the unstoppable golems embody such ancient artifice. And though the means to produce such entities lies far beyond the abilities of most magicians, the mighty spells remain hidden in old tomes and in the notes of the legendary scholars of magic who pioneered their creation. 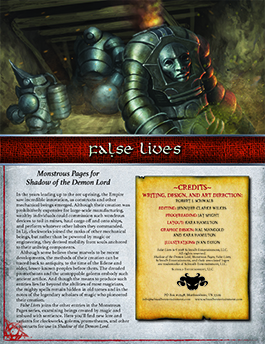 False Lives joins the other entries in the Monstrous Pages series, examining beings created by magic and imbued with sentience. 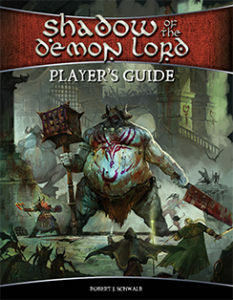 Here you’ll find new lore and variants for clockworks, golems, prometheans, and other constructs for use in Shadow of the Demon Lord. 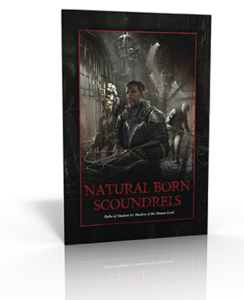 Buy False Lives from Schwalb Entertainment or DriveThruRPG today!